The last big date for Adobe Lightroom was back in July when Beta 3 finally made its way into the hands of the masses of Windows users. There wasn't a lot of fanfare at the time, however, things promise to be different for Beta 4, especially with the opportunity presented by the worlds biggest photographic show - Photokina. Obviously the list of new features and enhancements listed above are only the highlights, and no doubt you'll be wondering what happened to features such as: Dust Busting, Versions and Stacks. Well, this is Beta 4 not the final shipping product. 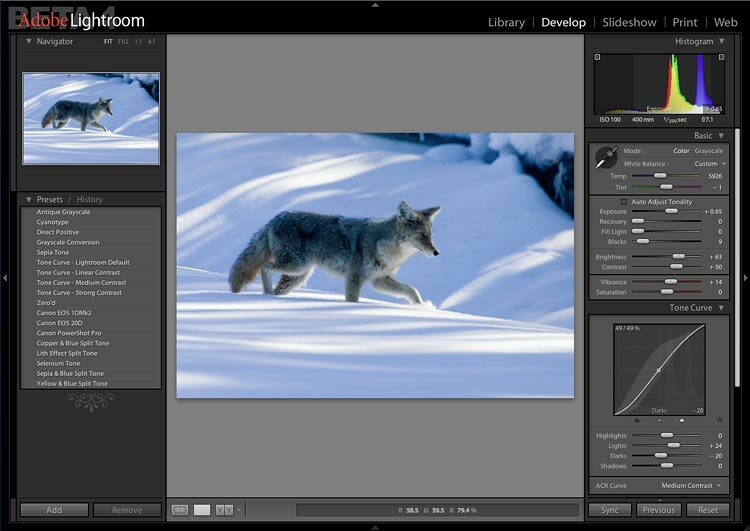 If you have been using Lightroom for a while you'll immediately notice that the UI has undergone a significant facelift. The silver look of Beta 3 is replaced with much more subdued grays. Likewise, the panel headers have also been cleaned up a lot with each now including context menus for switching them off. Whether users will like the new look or not is open to debate, but I think it has improved things a lot. Anyway, before getting too distracted by the updated development controls I suggest that you spend some time familiarising yourself with the new the UI, especially the context menus - Crtrl/right click everywhere and see what you find. Especially useful are those that allow you to configure side panel open/close behaviour and those accessed by clicking on a panel header (e.g. Quick Develop) that allow you to disable individual panels. The toolbar in Library has undergone something of a facelift, with lots of functionality being added. For example, you can now apply and remove ratings from the toolbar, run an Impromptu Slideshow, change the size of the Thumbnails, Rotate an image, and set your preferred Sort Order. You can maximise screens real estate by turning off the toolbar using the "T" key. To switch it back On again press "T" again. 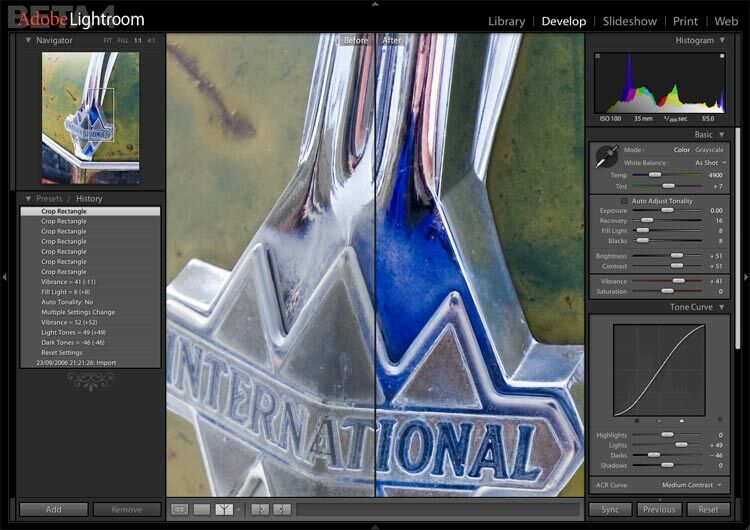 Importing images is an aspect of Lightroom that users have always found wanting. Beta 4 improves things a bit but probably still has some ways to go before it's nearly as slick as the competition. That said, the changes that have been implemented are to be welcomed. For example, you can now choose to use the preview embedded within the image (i.e. Use Embedded and Sidecar Previews) or previews rendered directly form the RAW images during import (i.e. Render Standard Previews). There is another preview option, but it's currently only available after import (i.e. 1:1 Previews). This last preview type is rendered using the default sharpen and denoise settings, so takes a while longer to create if done in a batch (Library module: Library>Render 1:1 Previews). If you've already imported images using either of the two options found within the import dialog then simply zooming into an image (press "Spacebar") is enough to create the 1:1 preview. Anyway, whatever preview type you choose to use you should find that import and preview generation in Beta 4 is significantly faster than in previous betas. By way of example, using my Apple Dual 2.5GHz G5 I imported 6000+ Canon EOS 1DMKII images in 2 hours 20 minutes using "Standard Preview"; the same process took in excess of 17 hours with Beta 3. Using the embedded preview option it took less than 35 minutes. Obviously, lower powered computers than mine will take longer, but should still be a lot faster than earlier betas. The options to import into a managed library or simply reference the images in their existing location remains. However, managed files can now be moved around within the Lightroom Library. Also, Shoots within the managed library now reflect real folders, so moving a Shoot really is the same as moving a folder. Likewise, images that are moved from Shoot to Shoot within the Managed Library also move in their respective folders. Shoots can also be named during import - double click the current shoot name and amend as required (e.g. highlighted Iceland 2004 in above screenshot). Another welcome addition to the import process is the new progress viewer. In the screenshot shown below you should be able to see that the viewer not only includes the progress but also has a small thumbnail of the image along with its name. The same progress monitor is used when exporting images or uploading them to the web. Like the Import dialog Preferences (see below) has undergone a few changes. Some users will immediately notice that the ability to switch off background processing is gone, well, that's because choosing to import using the Embedded or Sidecar previews option means that you no longer need it. Notice also that I've chosen Photoshop Elements as an External Editor. Making this choice in the Preferences dialog means that it will appear as an export processing action in the Export dialog. Once you get images into Lightroom it's time to get down to the real work of: Rating, Keywording, etc. In previous betas there was no visible indication of these tasks having been carried out, but Beta 4 has changed this for the better. 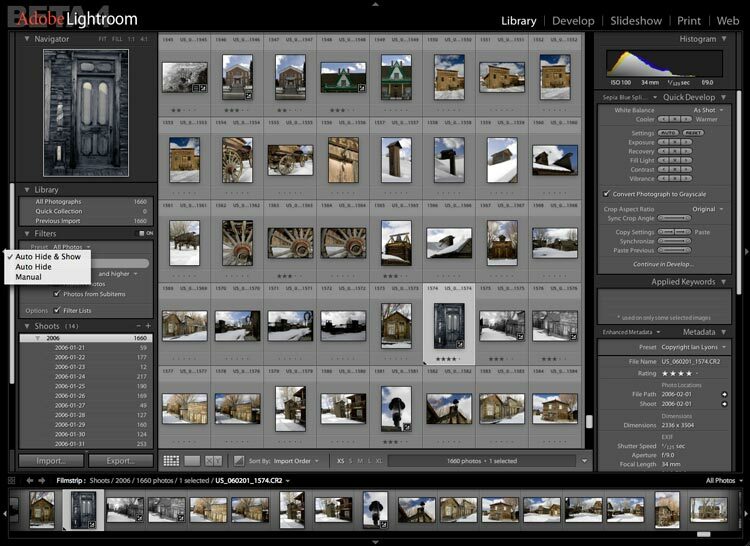 In Grid view you can set Lightroom to display Badges, which denote whether an image has been edited, rated, etc. The badges are also be visible in the filmstrip, which means that you can quickly check the status of an image from within module rather than switching back to the Library or Develop modules. Determining what and how information is displayed is the job of the new Library View Options dialog shown in above screenshot. The "J" key can be used to cycle through the various Grid view options. As an alternative to opening View Options you can right-click the 4 corners of the top section of the expanded type thumbnails and a context list containing all of the info options will appear. The "I" key can be used to cycle though the various user definable Information Overlays (also available in Develop module). The following screenshot shows a sample of the Info choices available in Loupe View (Library and Develop modules) along with how they will be displayed. Ratings or at least the method by which they can be applied has also undergone a few welcome changes. For example, Lightroom now supports auto advance, which is activated by pressing on the "Shift" key as you press the rating value between 0 and 5. However, an even better method is to set "Caps lock" key to On and thus avoid the need to hold down the "Shift" key. The ability to rename images already within the Lightroom Library was a really annoying omission from previous betas, but with the release of Beta 4 I think most users will be pleased to see that renaming of images is now supported. The token based approach used in the Import and Export dialogs has been reused within the new Rename dialog, which should mean that most users are up and running fairly quickly. The application of metadata to multiple selected images is now fully functional, so, adding a Caption or Title to the most selected image means that it will automatically be applied to all of the other selected images. At some point you'll probably want to burn part or all of your image Library to DVD, export it to an external disk or load it onto another computer. All of this is now possible from within Lightroom. The screenshot shown below is of the new Burn to disk as a Photo Binder dialog. 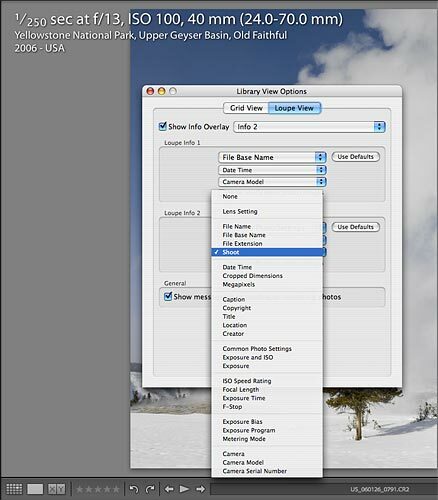 The Export Photos as Photo Binder option enables you to move "Shoots" from one computer to another with all adjustments, keywords, metadata, previews, etc intact. To load them onto the recipient computer you use Import Photos from Photo Binder command. The actual process is really quite straightforward, but can be time consuming on lower powered computers. Photo Binders are apparently intended to provide the means by which the libraries on two or more computers can be synchronised. However, until such times as we know for sure I think that the unitary library method is a safer bet than committing too much to Photo Binders. The last aspect of the Library module that I want to discuss is the Quick Develop panel. This panel seems to have its fair share of dissenters, which is a bit surprising when you consider the unique set of features that it provides. 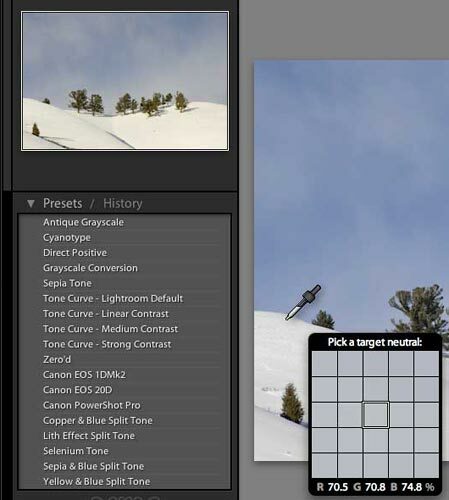 For example, lots of requests have been made for Lightroom to include a facility whereby Relative adjustments could be made to images rather than the more conventional Absolute adjustments. Well, Quick Develop already provides this functionality. Also, love it or hate it the Quick Develop panel sports the new Recovery, Fill Light and Vibrance controls, although I'm that sure of their utility in Library. The ability to Crop an image or apply an arbitrary rotation is still not available within the Library module, but a menu option that enables you to jump directly to the Crop controls with the Develop module can be found in the View menu. Alternatively, you can just press the "R" key. As with the Library module Develop has seen some very significant improvement, especially those associated with the Histogram, Basic and Tone Curve panels. Another important change is the fact that many of the Lightroom adjustments are now compatible with Adobe Camera Raw. Obviously some Lightroom adjustment controls aren't available in Camera Raw, so don't be expecting miracles. Nevertheless, these aren't the only big change/improvements in the Beta 4 Develop module. In Lightroom Beta 4 the Histogram is divided into 4 segments each of which corresponds with a specific control slider: Blacks, Fill Light, Exposure, Highlight Recovery. In the screenshot I've colour coded each segment for clarity: red for Blacks, blue for Fill Light, green for Exposure, and yellow for Highlight Recovery. Say you want to adjust exposure - click anywhere inside the green segment and drag left or right; note that the Exposure slider will also move. Alternatively, just hover the mouse over the exposure segment or slider and use the up/down arrow keys to increase/decrease the exposure. Then again you could simply grab the slider and drag it left/right, scrub the text input filed left/right or just type in a value. To reset Exposure back to default just double click inside the exposure region of the Histogram or on the slider button. So, now you know how the active Histogram works you can play around with it yourself. The Auto Adjust Tonality checkbox is another useful addition, which can be very useful, so don't dismiss it. 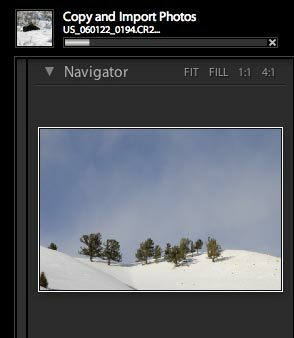 Once set to "On" drag sliders or histogram as required to fine-tune the image. Note that unchecking it does not reset the sliders to default. The little squares in the top right/ left corners of the Histogram are an idea derived from Raw Shooter to denote Highlight, Shadow and Channel clipping. Clicking on them switches them toggles them through various display modes. In one mode you they'll automatically light up to show which channel is clipping and in another they only light up when you roll the mouse over them. Again, experiment with them and all will become clear. Now that we know how the controls in the Histogram work it's time to explain what the new Recovery, Fill Light and Vibrance controls do. Anyone familiar with Adobe Camera Raw or earlier Lightroom betas will know that the Exposure slider was used so set the highlight point and Brightness was then applied to counteract any brightening or darkening of the midtones. The Exposure slider was also the means by which negative exposure could be applied to the image and thus recover highlight detail. Unfortunately, this process also tended to be a bit counterintuitive, hence the new Recovery slider. Now, instead of applying negative exposure to recover lost highlight detail you use the Recovery slider, which also has the benefit of not darkening the image. So, the idea is that you use the Exposure slider first to set the overall brightness level of the image, then drag the Recovery slider to the right until the highlight detail is recovered. Actually, the best way of using the Recovery slider is to begin with it set to 0 then press the Option/Alt key whilst dragging, thus activating the highlight clipping display in the image (i.e. same principle Camera Raw uses with Exposure slider). The Fill Light is another new control and can be used to brighten up shadows. Fill Light is the control that I've found most beneficial in Lightroom Beta 4. In particular, images that previously required the use of the Shadow/Highlight feature in Photoshop can now be edited very easily without even leaving Lightroom. The Brightness, Contrast and ACR Curve adjustments have been retained for legacy regions (i.e. compatibility with Camera Raw images), which means that they can generally be left in the their default positions. The release notes state that the Vibrance control was inspired by RawShooter, although the effects are somewhat different. Again, the release notes indicate that this slider controls a non-linear saturation adjustment, which should avoid blowing out the saturation on heavily saturated colours. Essentially this means that it effects lower saturated pixels more than highly saturated pixels. The Vibrance control is particularly effective when applied to flesh tones. The Tone Curve works in a similar fashion to the Histogram, but the segments relate to: Highlights, Lights, Darks, and Shadows. Floating the mouse over the Tone Curve or the image will result in a dot appearing on the curve. You can either drag this dot up or down to a adjust the curve. Alternatively you can use the Up/Down arrow keys. Also note that the old tone curve adjustments found in previous betas have been greatly simplified, and with the addition of the third "split point" (triangles under the curve) you should now have even more control than before. Remember that the "split points" can also be adjusted. Resetting the individual tone curve sliders back to zero is as easy as it was with the Histogram - double click the relevant region in the curve or the slider button. Likewise, double clicking the "split points" will reset them. Lastly, if you want to save some screen space you can close the slider section of the Tone Curve. Both the Histogram and Tone Curve have their own context menus that enable/disable some of the features described above, so make sure that you configure them to suite your own method of work. With the addition of the Recovery, Fill Light, and Vibrance adjustment toolset it has been necessary to redesign the Synchronise Settings dialog. Whilst important I think this particular dialog may becoming a little overloaded. The new White Balance tool along with its floating Pixel Magnifier and RGB readout should make setting the white balance a lot easier than it ahs been to date. You can still access it via the "W" key or simply click on it and drag it off its dock. Once you click on the image it will automatically re-dock. However, this change in operation from earlier betas mean that you can't easily make multiple attempts at white balance. Not to worry, hold down the "W" key and the tool stays active. Also, note that the navigator preview shows how the white balance will alter if you click the point under the sample tool. As with the Library module there's a new look toolbar in Develop module. At present it's fairly stark, which might imply that there are other tools waiting in the wings to be included when ready. The following screenshot shows two views of the redesigned toolbar with the lower version showing some of the hidden buttons. These buttons appear depending upon the actual type of split view. As with the Library module, you can maximise screens real estate by turning off the toolbar using the "T" key. To switch it back On again press "T" again. Other than the method of accessing the various Before and After views little has changed with this viewing mode. The following screenshot shows how the Before /After Left/Right Split appears on screen. 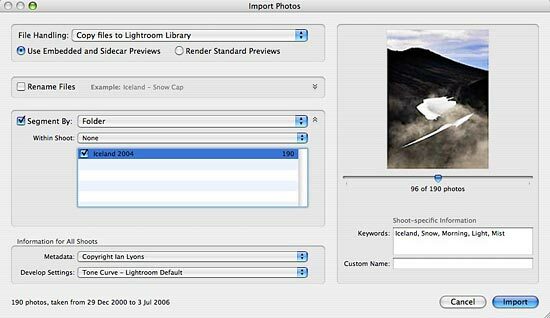 Exporting images from Lightroom is the only way that they they can be saved, so any improvements to the Export dialog need to make the task easier than it has been to date. However, as of going public the Beta 4 Export dialog only has one new feature, but it's very useful nonetheless. This new feature is found towards the bottom of the dialog and provides the user with a number of post-processing actions, which includes burning the images to disk or opening them into Photoshop. You might ask why a second method opening an image into Photoshop is required. Well, it could be any other editing application (e.g. 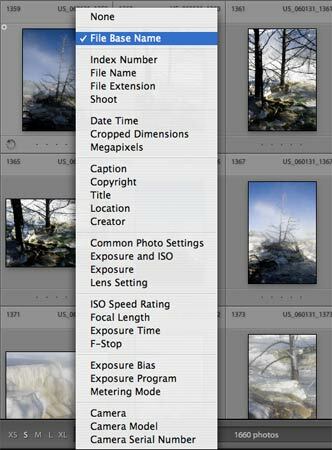 Photoshop Elements) that you've selected as the External Editor in Preferences. The last feature I want to mention is the ability to configure which panels are available on each pane. Previously all panels were displayed, which meant that even those you used rarely or not at all took up real estate and often required that you scrolled a lot. Beta 4 now has lots of context menus that allow you to switch these panels off. It also has context menus that allow you to control how/when the side panes, etc spring out and in. The following screenshot shows the context menu for the right Develop module pane. In this relatively short review I've only really skimmed the surface. To be honest there just too many new features to cover, so, I'll leave the rest for you to discover for yourself. In the meantime I'll try to add more information on features such as Photo Binders, etc. As for the features you hoped would be included but can't find, well it's the same as story as with Beta 3 - "Rome wasn't built in a day". Also, remember that this is still beta code, so there will be bugs (hopefully not serious). Nevertheless, if you do find a bug or think it might be, then report it via the Lightroom Bug Report Forum.